St. Louis Actors' Studio debuts ambitiously with A Delicate Balance. John Lamb Cheer up! A Delicate Balance is a fine look at a home and country deep in crisis. Through November 4 at the Gaslight Theater, 358 North Boyle Avenue. Tickets are $20 ($15 for students and seniors). Call 314-458-2978 or visit www.stlas.org. If you're going to start a new theater company, one of your most important decisions is also one of the earliest: the choice of your inaugural offering. That selection will serve to define your persona. It will tell potential audiences how serious your intentions are  as well as what is expected of them. 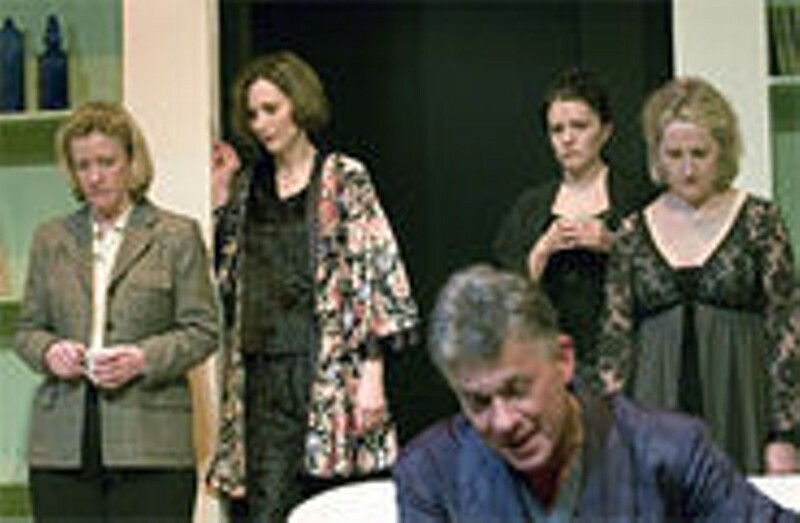 The fledgling St. Louis Actors' Studio, which debuted last week in the old Gaslight Square area, is making a bold statement by staging Edward Albee's A Delicate Balance, an ambitious drama that remains as scarifying today as it was when the play premiered 41 years ago. It is a Friday night in suburbia. The ineffectual Tobias (Larry Dell) is trying to assuage the verbal venom that fires back and forth between his patrician wife Agnes (Lavonne Byers) and her boozy sister (Tamara Kenny). Still more rancor looms when word arrives that their shrill daughter Julia (Sarah Cannon) is about to seek refuge at home after yet another failed marriage. All this jarring domesticity is interrupted by the unexpected arrival of Agnes and Tobias' closest friends. Harry and Edna (Brad Johnston, Penney Kols) have escaped the inexplicable terror they suddenly felt in their own home. Without waiting for an invitation, they abruptly move in. Problems arise. On its surface, this plot is clear enough. But Albee has always been a deceptively political writer. Beyond its probing of the boundaries of friendship, the primary concern of this 1966 play is to take stock of an America still shaken and dazed in the wake of President Kennedy's assassination. (The dead son in A Delicate Balance is not named John; that would be too obvious. Instead Julia's younger brother is named Teddy.) A Delicate Balance asks the question: How would you respond in time of crisis? Albee depicts a society in which the family structure is breaking down and no one knows how to set things right. A crippling fear of the future seeps through the pores of this play with the unstoppable, immutable force of flowing lava. In addition to evoking the moribund present, Albee also was startlingly prescient in predicting the future. The chilling references to terror and plague mark A Delicate Balance as the first American drama to anticipate the AIDS epidemic  ten years before that plague began. All these decades later the play retains its immediacy, as there are now new national and international fears to spook us into timidity. Note the copy of A Day in the Life of America, set off from the other volumes, on the upstage bookshelf. That book is not merely there to dress the set. The large glowing word AMERICA is a gold-embossed clue that A Delicate Balance is not really about the self-absorbed characters that inhabit Tobias' antiseptic living room; this story (which plays out over one weekend in the life of America) was  and continues to be  a warning to us: Daily life is indeed a delicate balancing act. The opening-night audience seemed to understand this. Much is asked of those who attend this play. It runs nearly three hours; attention must be paid. Almost every sentence has an echo, and David Wassilak has directed the piece at a slowly measured pace so that those echoing reverberations can be heard and felt. Yet the audience sat rapt through all three acts. Their sense of involvement was palpable. In an evening that is erratically acted, Lavonne Byers' Agnes is the production's true north. She alone senses the "dark silence" that infiltrates this world. It is often easy for Byers to home in on a character's weakness with a wink and a nod. Not so here. Her iron-willed matriarch is so disciplined as to be statue- still, with the result that we don't merely hear every line she says, we are able to consider every thought. "Everything becomes too late, finally," Agnes concedes in the waning moments. As Albee once explained, one of the play's themes is that "where choice is no longer possible, change is no longer possible." But theatergoers do have a choice. Here is an infrequent opportunity to be challenged by a disturbing play of the highest order.